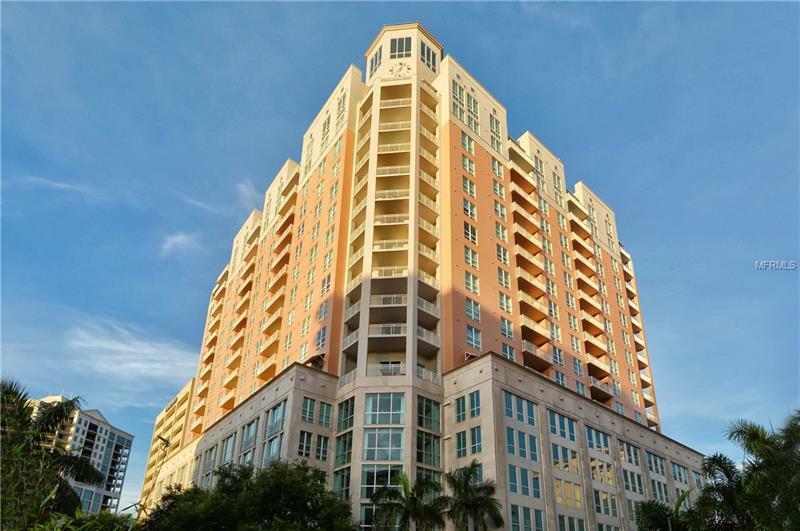 Enjoy the Downtown Sarasota Lifestyle from the most desirable and best located condominium. This split 2 bed 2 bath home has high ceilings, granite counter tops, stainless steel appliances, marble bathroom, and walk in closets on both bedrooms. Watch the beautiful sunrise from your balcony whilst sipping your morning coffee. Then later walk out of the lobby entrance and within a few steps you have fine dining, bars, shops, theatres, Opera, Marina and parks because you are living in the heart of the arts and entertainment section of our jewel of a city. Talking of parks, 1350 Main is a pet friendly building so not only will you be happy living here but so will Fido. The amenities in the building include 24 hour Concierge, resort style pool, bbq gas grill on pool deck, a guest suite for your out of town visitors, a gym as good as any professional fitness club, social & business meeting rooms, large a/c storage cage, and secured parking. This would also be an ideal investment as the previous tenant was on an annual unfurnished lease @ $2600 per month.